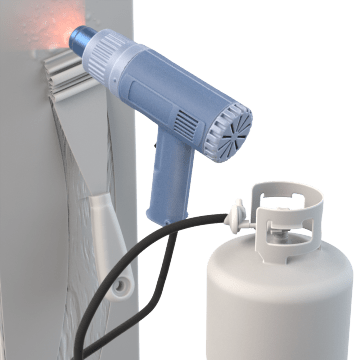 Also known as hot-air guns, these propane-powered heat guns and blowers are ideal for tasks in outdoor areas where there is no AC power source, such as softening and forming plastic, shrink wrapping objects, and thawing pipes. Propane heat guns and blowers have variable temperature settings and typically provide more powerful heat output over a larger area than corded heat guns. Some models have a temperature lock feature that allows users to lock in a desired temperature to prevent temperature fluctuations that can damage sensitive materials.